Pilotage or inshore navigation is what most of us boaters engage in most of the time. Because this sort of boating usually being close to the shoreline, it should be never be taken lightly. Even for ocean navigators the most dangerous part of the voyage is when approaching land. Perhaps the most important aspect of inshore sailing is knowing where the hazards are and avoiding them. The Importance of a Plan. While Pilotage is mostly visual navigation, the navigator/skipper will also need to monitor the depth, bearings and transits and be aware of tidal effects as well as keeping a general eye on the surroundings and other traffic. Add to this all the other tasks which need to be addressed at the beginning and end of any passage such as stowing or preparing mooring gear raising or lowering sails and the skipper can be overwhelmed with tasks. Pilotage is usually required when sailing close to either land and/or other navigational hazards. This can often mean that there is little room or time for error. The planning of course should be done before setting off and added to the overall passage plan. The extra advantages of having gone through the planning stage are that you will have gathered together all the relevant tables, charts, etc and will be setting off with a reasonably clear idea in your head of the things to watch out for. 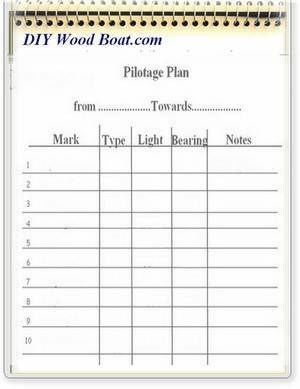 So a well prepared pilotage plan one that is simple easy to read and at the same time is flexible will make the skipper’s task easier and allow him to remain on deck with few visits below to check the chart. And as it is meant to be used in the cockpit, it needs to be waterproofed. There are numerous plastic sleeves, ‘ziplock’ food bags and those presentation folders that can be used for this purpose or even one of those hill walkers map cases. It is also worth having a spare copy in your passage plan just in case first one gets too wet to read or even blown over board. However you protect it, it should be easy to read regardless of the conditions. In poor conditions especially at night eyes can become strained and spectacles can mist up so, keep it bold and simple. Quite how you record your plan will depend on what works best for you and how complex the passage is going to be. The place to start is on the chart where you mark up the planned route or routes and note all the navigation aids, hazards, bearings and distances of each leg of the route. You may also wish to include other information from your Passage Plan such as that gained from Pilot Books, Local Notices to Mariners, the Tidal Atlas or Local Knowledge. 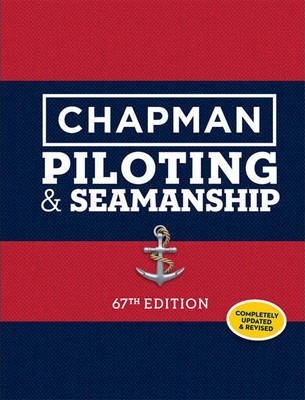 However, keep it simple and easy to read, especially for night navigation . And remember your Plan should allow you to remain flexible should circumstance dictate. One of the most common ways to record the pilotage plan is to simply make a list of the marks, transits, hazards etc in the order in which you intend to pass them. 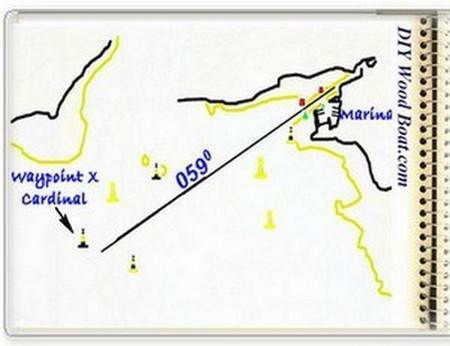 Include enough information for you to recognize the mark, is it a port or starboard, or a northerly or southerly cardinal and many buoys have names or numbers marked both on the chart and on the buoy itself which could be recorded on the plan. Include the bearing to the mark from the previous one and any transit bearings or sector lights. You could also record the names and information of any waypoints you have entered on your GPS. Another common method is to make a simple sketch or take a tracing from the chart. This should show the information described above and could also show the main shallow areas to avoid and perhaps conspicuous marks on shore. But as with the list, keep it simple. Of course you could use both methods combined. You don’t want to spend more time drawing up a plan than it is going to take to complete the trip. On the other hand the process of preparing the pilotage plan will help to fix the main points in your mind making it easier to have an overall picture of the trip in your minds eye. You will need to re-size any photo larger than 800x600 pixels using your graphics software or a Web-based re-sizer, such as Google's Picasa for PC users or iPhoto's Export function on a Mac. Should you have problem uploading photos you can use the link below to securely send them to me.